Parsons House burned c. late 1970s. The five dormers were lost along with the Chippendale railing around the upper porch and the slate roof. 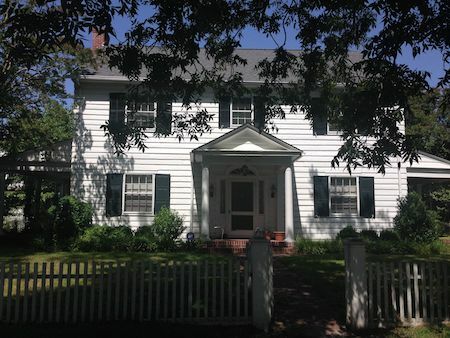 The house is now the Chesapeake Bay View Bed & Breakfast. 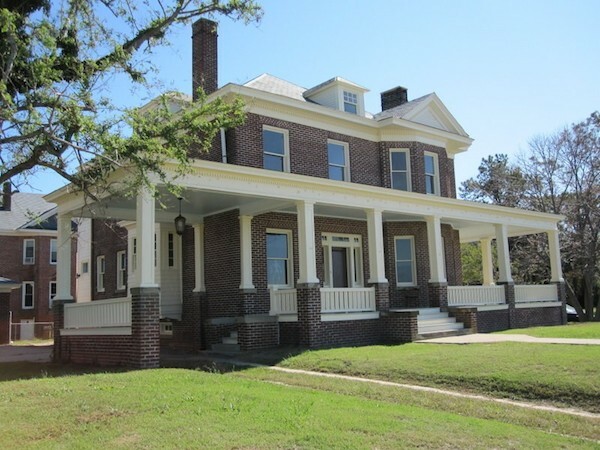 VIRGINIA SAVAGE: Where was the Fitzhugh house? VIRGINIA FITZHUGH: Right there on the corner where Shrieves lives [southwest corner of Randolph and Peach]. The yellow house on the corner of Peach and Randolph. And that’s where you started housekeeping. Did Mr. Fitzhugh build that house? No. 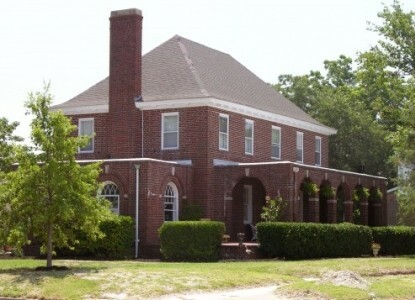 That house was built by Dr. Kellam, the doctor that was in Cape Charles. And Mr. Fitzhugh bought it from him. Now the house next to that where the Johnsons lived now. And the next house was Harold Smith’s. That’s right. That was a boarding house. That was an old Federal type building there [torn down in the ’80s]. Do you remember when the Mack buildings were built? Yep. They were built late. I would say ’30s or ’40s. Do you remember when Mr. Parsons built his house on the beach? Mr. Russell Parsons . . . Miss Alice Parsons. The one the second floor burned probably during the late ’70s. I don’t know how old I was when that was built. Mr. E.P. 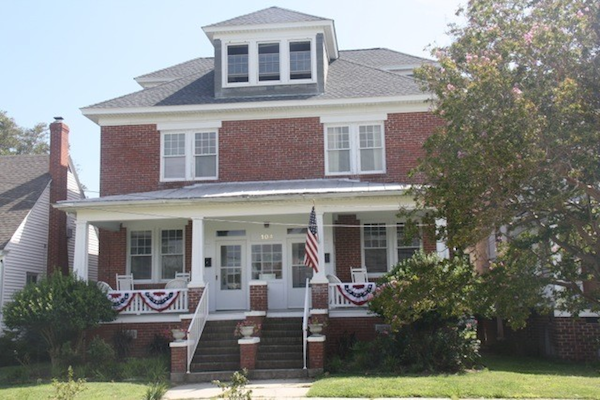 Dryden operated a grocery store on Mason Avenue when he built this residence in 1912 on the corner of Bay and Tazewell. The house was recently magnificently restored by a Richmond family. VIRGINIA SAVAGE: Let’s talk about Randolph Avenue. You lived in the Wilkins house. Now that was the Wilkins that built what is now the Methodist Parsonage. And the other Wilkins was Elliott’s grandfather. And then he built both of those houses. The Eleanor Lowe house I believe is next and Mr. Jack Scott built that for her. Do you remember when that was being built? VIRGINIA FITZHUGH: No. Eleanor was older than me, and I don’t remember. You know, Virginia, back in those days you didn’t roam around town like the kids do today. You just went so far and that was it. You just had your group of friends. He built that and the one next to that is that bungalow and that was built by Sterling, a man named Sterling. I think a Miss Sterling lived in that when I came here. No, a Mrs. George Guy. She was a caretaker. What did the Sterlings do? Well, you know where Lee Sterling lives. Well, that house was on the corner where the Post Office is now. That house has been moved and turned around and that was the Sterling house. This is the house across Tazewell Avenue and one from the corner from the Presbyterian Church that you’re talking about. The great big house and they moved it back. There was an explosion in the late ‘60s and it burned. A new house has been built, very close in type to the old houses. 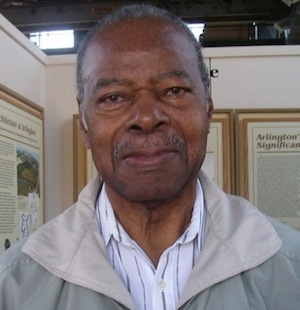 Lee Sterling worked at Colonial Store. 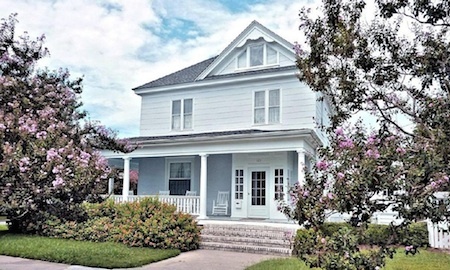 101 Tazewell Avenue, corner of Harbor, was “right on the beachfront” when built by Capt. Sadler c. 1912. Later, Harbor Avenue layout was skewed to accommodate the house. VIRGINIA SAVAGE: I am talking to Virginia Fitzhugh, who was born and raised in Cape Charles. Virginia, what was your maiden name? West side of Virginia Hotel? Which would be right across from the Post Office on the corner of Strawberry and Randolph. That’s where I was born. And then Daddy bought the house up in the middle of the block on Randolph. I don’t know who lives there now but he bought right in the middle. Alva Stiles used to live there. And then Daddy built the first house that was built this side of Pine Street other than the house that was back in the woods. And he bought the lot from the Scott Estate and built down there. And we thought we were right on the beachfront. The corner of Tazewell and Harbor. Did he have to build that house on pilings? No. He happened to get the house part of the land that was down there. And see, the beach came right up to Harbor Avenue. Sand and everything. That’s a built in place from Harbor right up to beachfront. That was sand that was blown up and built up all that up there. Daddy thought he was right on the beachfront. Isn’t that amazing! I knew that Jeannette Edgerton’s house, for one, was built on pilings.